There are a few options, and I will explore these in another blog post. But my daughter and I had a thought that we could make our own magazine, called Smiley Times, to publish stories by young writers. 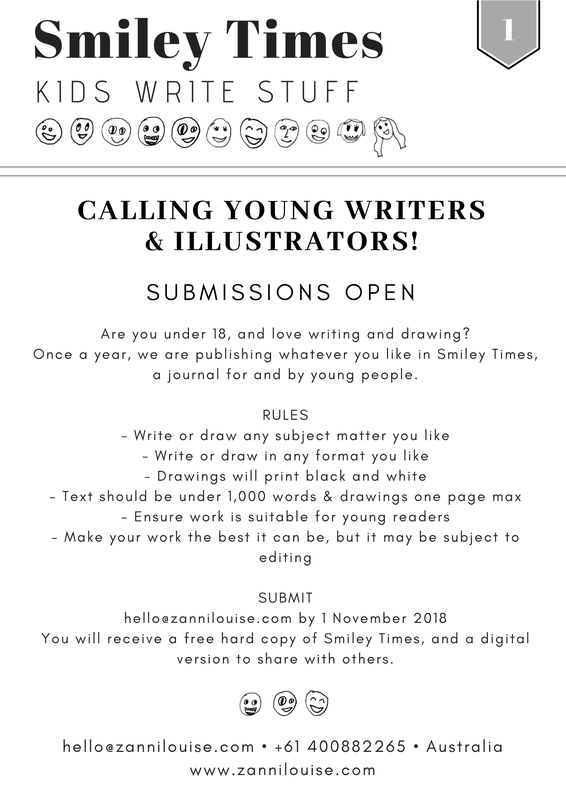 Everyone under 18 is invited to send in their story or illustration before the 1 November 2018. All formats and story themes are welcome. The only restriction is that text is less than 1,000 words. All stories submited will be published. Kids should make their work the best it can be, but their story may be subject to editing. Published authors and illustrators will receive a free copy of the magazine, and can invite others to purchase copies to help cover costs. This is a great incentive for kids to finish their stories, polish them, see their names in print, and share with others. It’s also cool to be able to read stories other kids have written!